Indonesia ranked 72nd out of 190 countries in the 2018 Ease of Doing Business, according to the World Bank’s latest report entitled “Doing Business 2018: Reforming to Create Jobs”. This means Indonesia rose by 19 positions compared to 2017, where Indonesia is ranked 91. This achievements continue the trend of accelerating the increase in ranking in the past two years. In 2017, Indonesia’s position rose by 15 positions from 106 to 91. Thus, in the past two years, Indonesia has climbed 34 positions. Earlier, in the 2017 EODB, Indonesia’s position is ranked between 116 and 129. “In the past three years, Indonesia has become an easier place to do business. This achievement is inseparable from the hard work of all parties,” Coordinating Minister for the Economy Darmin Nasution said in a press release, Wednesday (1/11) afternoon. In comparison, the development of other ASEAN countries’ rankings in the past 2 years include: Vietnam rose by 23 positions, Thailand rose by 20 positions, Malaysia fell by 2 positions and the Philippines fell by 14 positions. According to the World Bank report, the sharply improved indicators of Indonesia’s EODB are: (1) Resolving Insolvency from 74th in EODB 2016 to 38th in EODB 2018 (rose by 36 positions); (2) Enforcing Contracts from 171st in EODB 2016 to 145th in EODB 2018 (rose by 26 positions); (3) Getting Electricity from 61st in EODB 2016 to 38th in EODB 2018 (rose by 23 positions). 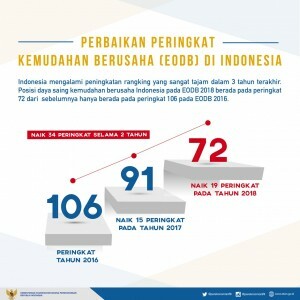 When it comes to the target set by President Jokowi in order for Indonesia’s EODB ranking to be in 40th, Coordinating Minister Damin revealed the steps to be taken by the Government, such as: improving the EODB 2018 ranking (144th) of starting a business by reducing licensing procedures and implementing online system services. In addition, improving the EODB 2018 ranking (114th) of the Paying Taxes by continuing the e-filing program and improving tax database; improving the EODB 2018 ranking (112th) of Trading across Borders by reducing the number of crossings, applying integrated risk management, and using an online system. Finally, Darmin continued, improving the EODB 2018 ranking (108th) of dealing with construction permits by means of simplifying procedures and strengthening building inspections. (Public Relations of Coordinating Ministry for the Economy/ES) (MUR/YM/Naster).